The Battle of the Granicus River in May 334 BC was the first of three major battles fought between Alexander the Great and the Persian Empire. Fought in Northwestern Asia Minor, near the site of Troy, it was here that Alexander defeated the forces of the Persian satraps of Asia Minor, including a large force of Greek mercenaries led by Memnon of Rhodes. Location of the Battle of Granicus. The battle took place on the road from Abydos to Dascylium (near modern-day Ergili, Turkey), at the crossing of the Granicus River (modern-day Biga Çayı). After the death of Phillip of Macedon, many of his newly conquered territories desired to take advantage of the perceived weakness of the new young king. These nations included the Illyrians, Thracians, and some southern Greek city-states. Alexander had to prove the strength of his rule before leaving for his Persian expedition, and crushed several nascent rebellions within Greece and the northern tribes. After extensive planning in Macedonia, Alexander started to prepare for his next major conquest: the invasion of Asia. Before leaving Macedon, Alexander appointed his father’s experienced general Antipater as regent in his absence, leaving him with 9,000 infantry and 1,500 cavalry to maintain control over Macedonia's holdings in Europe. In the spring of 334 BC, Alexander took 2,600 cavalry and went on a 20-day march from Macedon to Hellespont, to join Parmenion in Asia. Before Alexander and his army were able to cross at Hellespont, the Persian provincial governors, and others in power at that time in Persia, assembled their forces of 10-20,000 cavalry and 5-20,000 infantry to the town of Zelea. Memnon was a high-ranking Greek mercenary employed by the Persians, and he advised the Persians to lay waste to the land that Alexander would have to pass, depriving his army of food and supplies. This would make it harder for Alexander and his army to survive on their long journey before the battle. The satraps did not trust Memnon because of his nationality, and did not ravage their territories. The Persians had two major objectives; first, they would try to force Alexander toward a position of their choosing before he could continue inland, and second, the Persians hoped to be able to be in a defensive position that would minimize Alexander's advantage in infantry. The Persians advanced from Zelea to the Granicus River, which would be an obstacle for Alexander and his army. The Persians hoped that his army would not be able to hold formation, which would severely cripple its effectiveness, as maintaining the closely packed and mutually supportive formation typically employed by the Greeks was central to their strategy. The Persians awaited the arrival of the Macedonians with all their cavalry in the front line. Alexander, after crossing into Asia at the Hellespont, then marched 100 km back to the north to meet the Persian armies. According to Alexander's biographer Arrian, Alexander's army met the Persians on the third day of May from Abydos. Alexander's second-in-command, Parmenion suggested crossing the river upstream and attacking at dawn the next day, but Alexander attacked immediately. This tactic caught the Persians off guard. The Macedonian line was arrayed with the heavy phalanxes in the middle, and cavalry on either side. Alexander was with the Companions on the right flank. The Persians expected the main assault to come from Alexander's position and moved units from their center to that flank. Achaemenid satrap of Lydia Spithridates, attacking Alexander from behind at the Battle of Granicus. Charles le Brun (detail). The battle started with a cavalry and light infantry feint from the Macedonian left, from Parmenion's side of the battle line. The cavalry squadron was led by the officer Ptolemy, son of Philip. The Persians heavily reinforced that side, and the feint was driven back, but at that point, Alexander led the horse companions in their classic wedge-shaped charge, and smashed into the center of the Persian line. The Persians countercharged with a squadron of nobles on horse, and accounts show that in the melee, several high-ranking Persian nobles were killed by Alexander himself or his bodyguards, although Alexander was stunned by an axe-blow from a Persian nobleman named Rhoisakes. A second Persian nobleman named Spithridates attempted to attack Alexander from behind while he was still reeling; however, he was himself killed by Cleitus the Black, who severed his outstretched arm. Alexander quickly recovered. Eventually the Macedonian horse were able to gain the advantage over their Persian counterpart, owing to the superiority of their lance over the Persian javelin for melee fighting, as well as the close support of the light infantry interspersed among their squadrons. The Greek cavalry then turned left and started rolling up the Persian cavalry, which was engaged with the left side of the Macedonian line after a general advance. A hole opened in the recently vacated place in the battle line, and the Macedonian infantry charged through to engage the poor-quality Persian infantry in the rear. The Macedonian phalanx then attacked the Greek mercenaries. With many of their leaders already dead, and their infantry routed, both flanks of the Persian cavalry retreated, seeing the collapse of the center. The infantry routed too, many being cut down as they fled. Total casualties for the Greeks were between 300 and 400. The Persians had roughly 1,000 cavalry and 3,000 infantry killed, mostly in the rout. The Greek mercenaries, under the command of Memnon of Rhodes, who fought for the Persians, were abandoned after the cavalry retreat. They attempted to broker a peace with Alexander but to no avail. As a result, after the battle Alexander ordered the mercenaries to be enslaved. Out of the 18,000 Greek mercenaries, half were killed and 8,000 enslaved and sent back to Macedon. It is believed that Alexander had a strong majority of the mercenaries enslaved in fear of plague. Also, Alexander sent 300 Persian armours to the Parthenon of Athens as an oblation to Athena, with this epigram: "Alexander, son of Philip, and the Greeks, except of Lacedaemonians, from the barbarians who live in Asia". («Ἀλέξανδρος Φιλίππου καὶ οἱ Ἕλληνες, πλὴν Λακεδαιμονίων, ἀπὸ τῶν βαρβάρων τῶν τὴν Ἀσίαν κατοικούντων»-"Alexandros Philippou kai hoi Hellēnes plēn Lakedaimoniōn apo tōn barbarōn tōn tēn Asian katoikountōn"). That account of the battle is directly contradicted by Diodorus Siculus who states "When Alexander learned of the concentration of the Persian forces, he advanced rapidly and encamped opposite the enemy, so that the Granicus flowed between the encampments. The Persians, resting on high ground, made no move, intending to fall upon the foes as he crossed the river, for they supposed they could easily carry the day when the Macedonian phalanx was divided. But Alexander at dawn boldly brought his army across the river and deployed in good order before they could stop him. In return, they posted their mass of horsemen all along the front of the Macedonians since they had decided to press the battle with these. Memnon of Rhodes and satrap Arsamenes held the left wing each with his own cavalry; Arsites was stationed next with the horsemen from Paphlagonia; then came Spithrobates satrap of Ionia at the head of the Hyrcanian cavalry. The right wing was held by a thousand Medes and two thousand horsemen with Rheomithres as well as Bactrians of like number. Other national contingents occupied the centre, numerous and picked for their valour. In all, the cavalry amounted to more than ten thousand. The Persian foot soldiers were not fewer than one hundred thousand, but they were posted behind the line and did not advance since the cavalry was thought to be sufficient to crush the Macedonians." The record of Arrian and Diodorus on the battle of Granicus can't be reconciled so historians usually prefer Arrian, although some revisionists try to reconcile the two accounts. Historian Peter Green, in his 1974 book Alexander of Macedon, proposed a way to reconcile the accounts of Diodorus and Arrian. According to Green's interpretation, the riverbank was guarded by infantry, not cavalry, and Alexander's forces sustained heavy losses in the initial attempt to cross the river and were forced to retire. Alexander then grudgingly accepted Parmenion's advice and crossed the river during the night in an uncontested location, and fought the battle at dawn the next day. 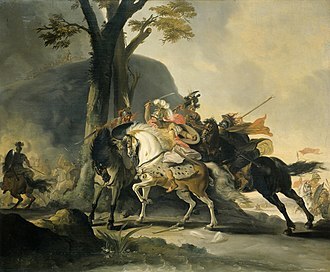 The Persian army hurried to the location of Alexander's crossing, with the cavalry reaching the scene of the battle first before the slower infantry, and then the battle continued largely as described by the Arrian and Plutarch accounts. Green accounts for the differences between his account and the ancient sources by suggesting that Alexander later covered up his initial failed crossing. Green devotes an entire appendix in support of his interpretation, taking the view that for political reasons, Alexander could not admit even a temporary defeat. Thus, the initial defeat was covered up by his propagandists by a very heroic (and Homeric) charge into the now well-deployed enemy. In his preface to the 2012 reprint, Green states: "on the evidence as it stands that theory remains untenable and the contradiction inexplicable." Towards the end of this battle, Alexander buried the Persian commanders and the Greek mercenaries who were killed fighting on the side of the enemy. Those he took as prisoners were bound in fetters and sent away to Macedonia to till the soil, because, although they were Greeks, they were fighting against Greece on behalf of the foreigners, in opposition to decrees which the Greeks had made in their federal council. To Athens also he sent 300 suits of Persian armour to be hung up in the Acropolis as a votive offering to Athena and ordered this inscription to be fixed over them so as to mark the absence of the Spartans in his united Greek army: "Alexander, son of Philip and all the Greeks except the Lacedaemonians, present this offering from the spoils taken from the barbarians inhabiting Asia". ^ a b Welman estimates the Persian army to be 25,000 in total, including 10,000 cavalry and 5,000 Greeks. Fuller (1960) estimates 15,000 in total. Delbrück (1920) estimates as low as 6,000 in total. ^ a b Arrian in describing another battle considers that the proportion of twelve to one between wounded and killed is above what could have been expected (5.24.5). Riiatow and Kbchly (p. 27) state that in modern battles the ordinary proportion of wounded to killed is from 8:1 to 10:1. A total number of 115 is given as killed and 10 times of that for the wounded by Grote, George. A History of Greece From the Earliest Period to the Close of the Generation Contemporary with Alexander the Great. ^ a b c d e Mixter, John R. "Wars of Alexander the Great: Battle of the Granicus". Historynet.com. Retrieved 2013-07-19. ^ Arrian Anabasis Alexandri I.14. ^ Green, "Preface to the 2012 edition", Alexander of Macedon, Kindle edition. ISBN 0520275861. Wikimedia Commons has media related to Battle of the Granicus. Moerbeek, Martijn (1997). The battle of Granicus, 333 BC. Universiteit Twente. Welman, Nick. Battles (Major) and Army. Fontys University. "Wars of Alexander the Great: Battle of the Granicus." HistoryNet.com Live the History. www.historynet.com/wars-of-alexander-the-great-battle-of-the-granicus.htm (accessed April 15, 2013). "Battle of Granicus." Ancient Babylon. (accessed April 10, 2013).